Weird craving confession time: I frequently crave lentils. I don’t know why. I didn’t eat them as a kid so there are no fond remembrances or suppressed memories of lentils. My first exposure to these little gems likely came as a college student living in Salt Lake City and that exposure likely occurred in a Mediterranean restaurant we frequented fairly often. Whatever the case, I love them for no particular reason except that they satisfy a hunger for something simple, earthy and filling. Lentil soups do the trick, but my favorite use of the legume is in a pilaf or cold salad paired with brown basmati rice, diced veggies like carrot and celery and seasoned liberally with salt and pepper. Lentils lend themselves to heavy seasoning. I love to experiment with “exotic” spices to scent lentils, which means taking a deep dive into the spice cupboard. Garam Masala, cardamom, cinnamon, turmeric, cumin, dry mustard, and saffron – the possibilities are endless. We keep green lentils on hand, but I love the look and shape of the smaller bluish-black French lentils, which look like caviar. Red lentils are beautiful, but they’re really more of a dry pea and taste like them. All are worth keeping in your pantry for a quick, delicious and incredibly nutritious main or side dish. 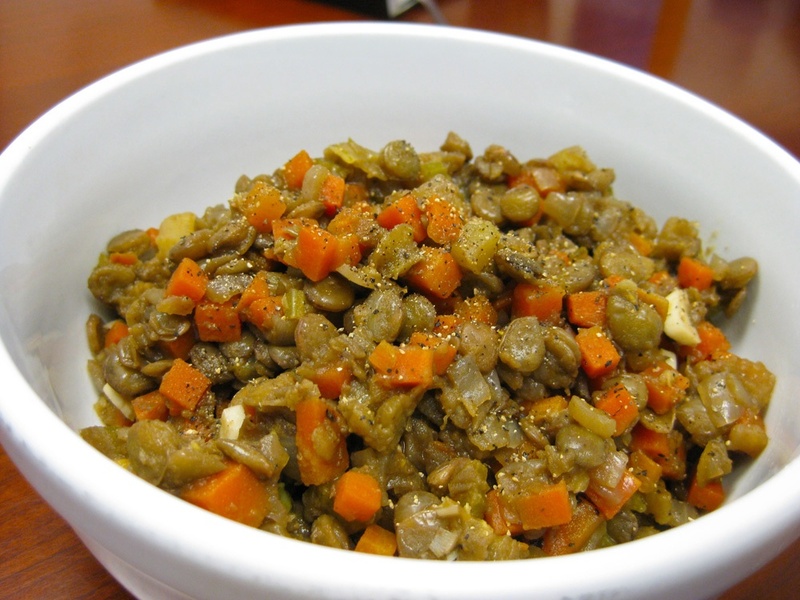 High in protein and fiber, lentils sit near the top of most super foods lists. Vegetarians can add a complete protein to their diets by combining lentils with brown rice. Of the beans we keep on hand, lentils are hands-down the simplest, quickest to cook. No pressure cooker or overnight soaking necessary. From dry, the beans will cook in 20 – 30 minutes at the boil. The small, dark French lentils are a bit firmer and may take more time, but not much. 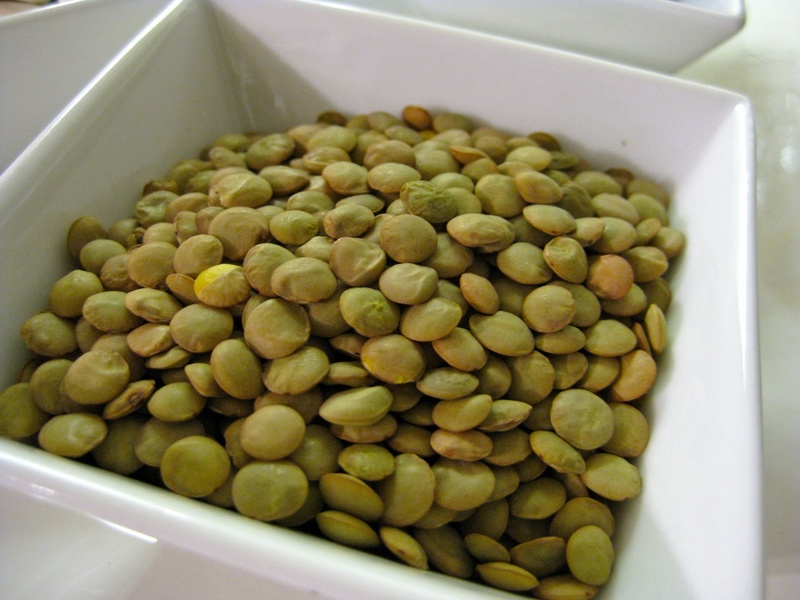 Like most beans, lentils should be cooked in unsalted water to prevent them from getting tough. I like to add a bay leaf to the cooking water to start the seasoning process from the beginning. If you’re going to use them for salad or pilaf, they should be drained and set aside to cool before combining them with other ingredients. Cooked lentils are tender so they need to be handled carefully to prevent them from turning into a big mash. They firm up a bit as they cool making them easier to fold with other ingredients. I like the vegetables I mix with them to be diced small enough that they look roughly the same size as the lentils. When I’m ready for them, I’ll heat olive oil in a skillet and add the dry spices for a quick sauté to allow the oil soluble flavors to “bloom” before adding carrots, celery, onion and garlic. Be sure to keep the flame at medium heat to be sure not to brown them. Once the veggies are tender and fragrant, take them off the heat and gently fold them into the cooled lentils. I think this dish is best at room temperature, but it makes for a nice cold salad spooned onto a leaf of butter lettuce and finished with a sprinkle of sea salt, a bit of fresh ground black pepper and a drizzle of extra-virgin olive oil. « Older Post Big Game Chili — Chocolate Cherry Chili	» Newer Post Waffle Weekend!